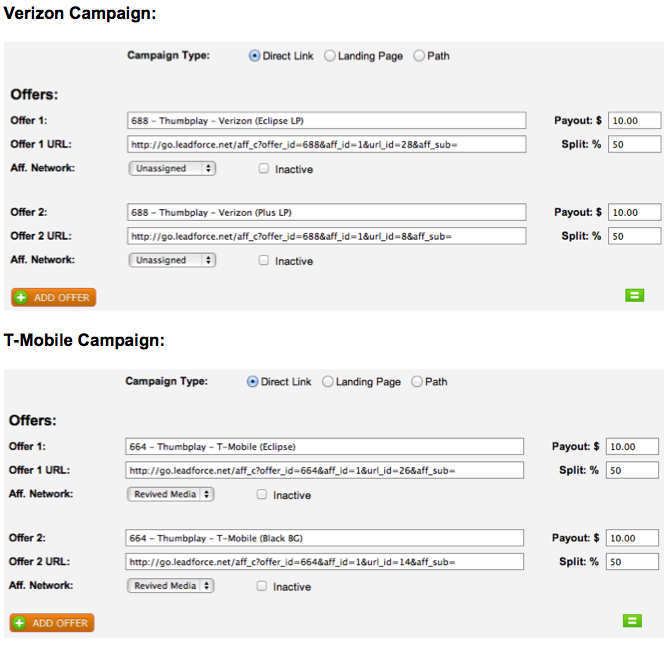 Campaign Level Post-Click Mobile Traffic Redirects. A powerful feature of iMobiTrax is the ability to re-direct traffic when a user clicks on your unique tracking link and directing them to an offer or landing page that is unique to their geographic location, mobile device, carrier, network speed, or other important metrics such as if they’re using Wifi or not. This allows your campaigns to reach a much broader audience and be able to filter the traffic efficiently yielding the highest quality results for clients. 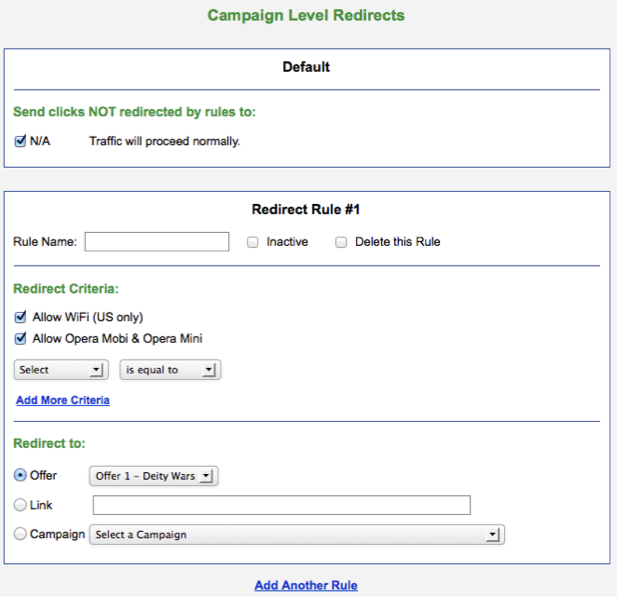 This feature allows you to specify where the clicks not redirected by rules will be routed. 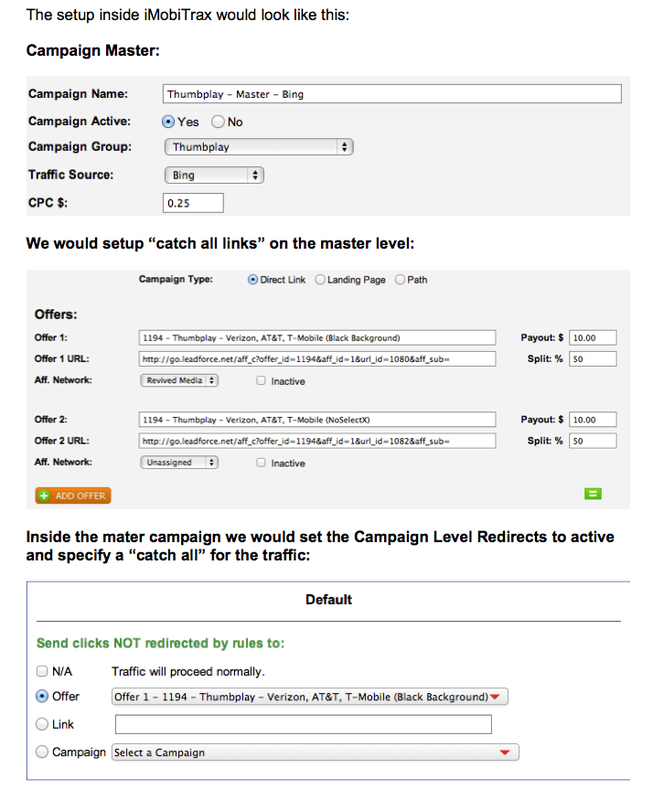 By default the traffic will proceed normally based on how the campaign is setup. You also have the option to send them to a particular offer, an external link, or another campaign. 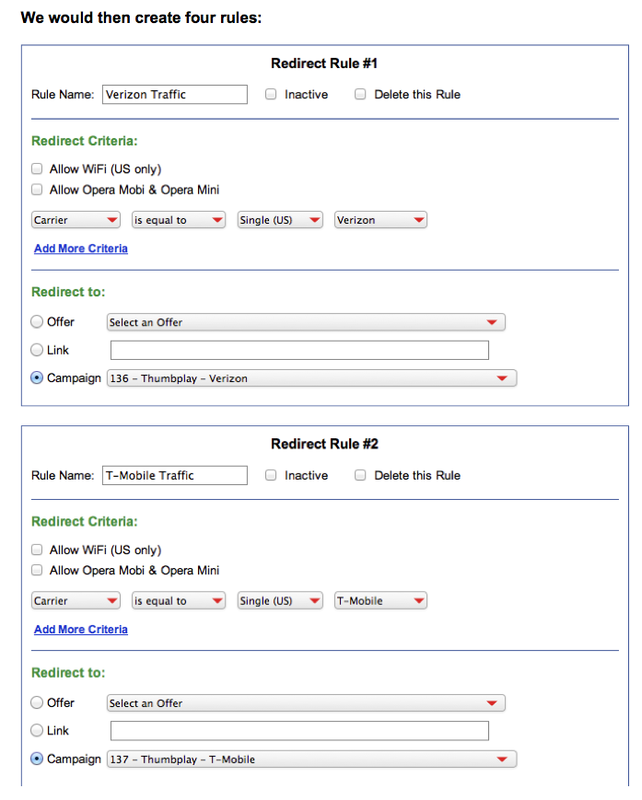 When you’re ready to create your first redirect rule, you will assign it a unique name (under Redirect Rule #1) and will then proceed to Report Criteria. You’ll first notice two check boxes. 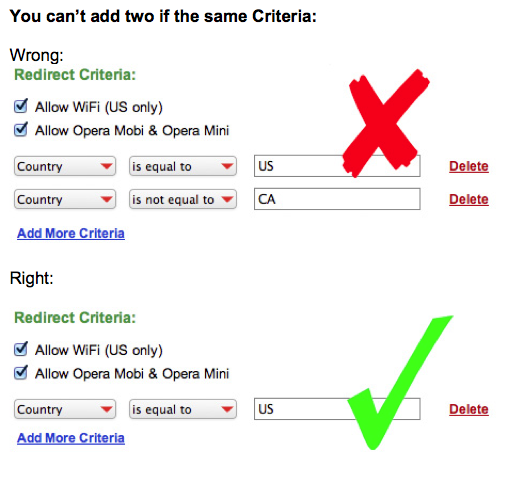 One is to accept traffic from Wifi (US only) and the other is to accept Opera Mobi & Opera Mini traffic. If you were creating a rule to accept Wifi traffic (for the United States only) then you would leave this selected and then specify how to handle the traffic. The same is true for accepting Opera Mobile & Opera Mini traffic. 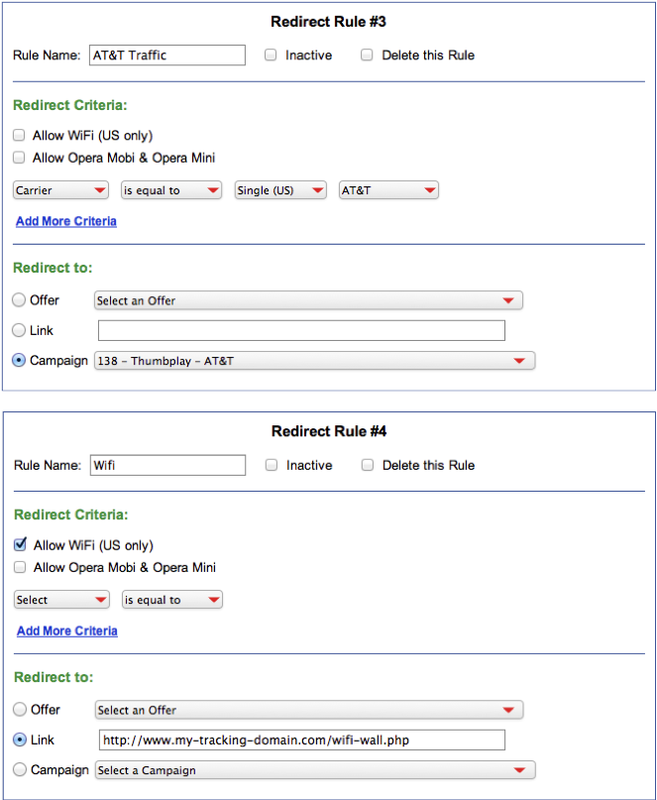 If you unselect them the rule will not direct that traffic to the specified redirection source (an offer, custom link, or campaign). Opera Mini and Opera Mobi traffic will be tagged in the database to include manufacturer, device name, model, combined name, and marketing name. 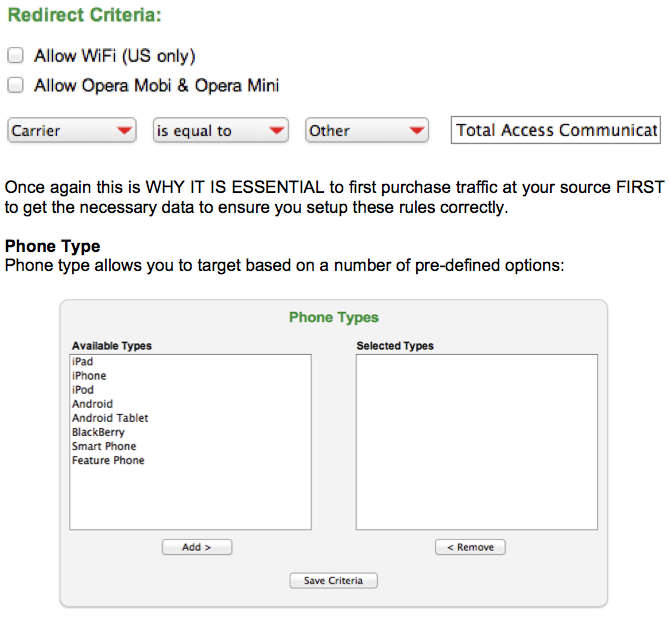 For example you may find HTC One S (on Opera Mobi) in your statistics. Inside the United States these options are fairly self-explanatory. 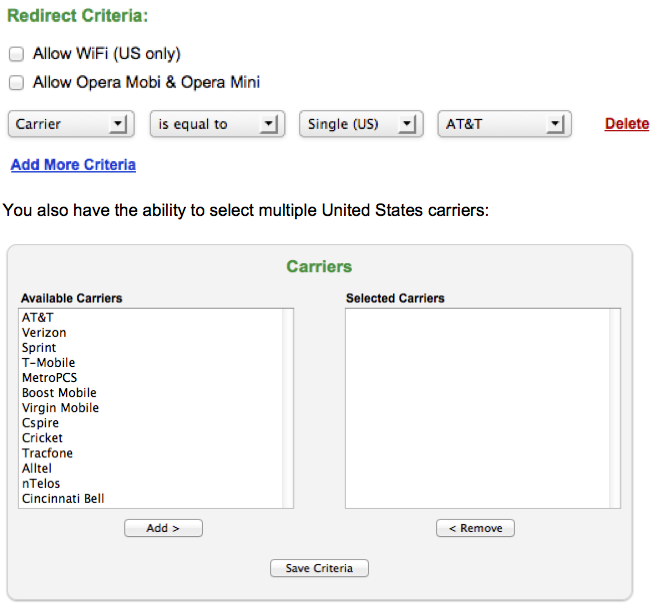 Simply point, click, and select the carriers you wish to target or wish to avoid. 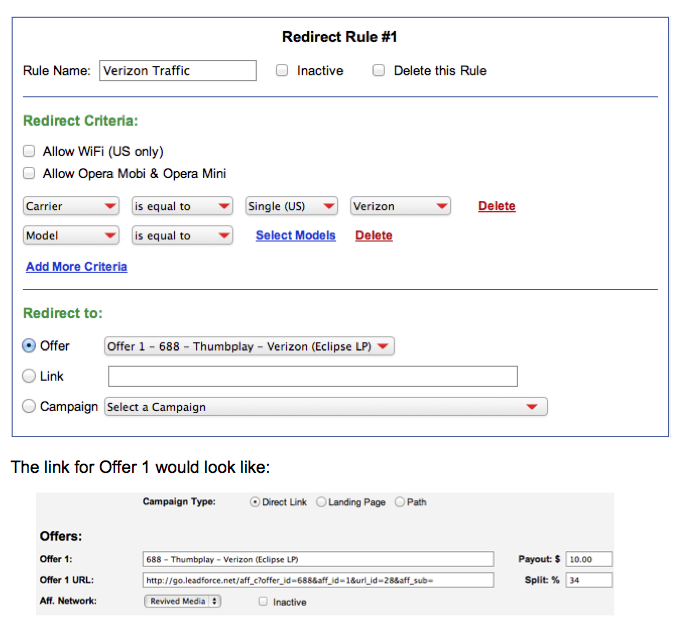 You can then set the campaign to custom redirect. When using this option Internationally it is VERY IMPORTANT to have exact carrier/ISP data from your traffic source before hand. For example, you may wish to target the operator DTAC in Thailand. However at some traffic sources all of the traffic isn’t labeled DTAC but rather Total Access Communication PLC which is a division of DTAC. Therefore if you simply enter DTAC into the redirection rule, the traffic won’t properly redirect. This requires a bit of research and data collection to perfect but can greatly increase your ROI as you’re able to much broader target your traffic reducing the cost per click and increasing your overall volume. You will find this rule particularly beneficial when trying to separate your traffic from feature phones, Androids, iOS, smart phones, etc. Keep in mind that the smart phone option doesn’t include Androids/iPhones rather devices such as the Palm Pre, certain Samsung’s (that don’t use the Android OS), etc. 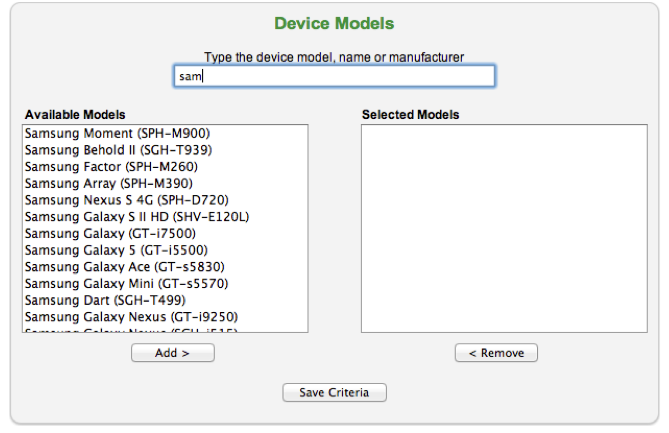 Another important criteria you can select to create a redirection rule is device manufacturer. As with phone type you’re able to select one or multiple. We also provide the option to enter in a unique manufacturer in the event we don’t have it listed (ie: on an older/discontinued device). As with the Carrier, it is VERY important that you first run traffic at your source to determine “other” manufacturers (if applicable). 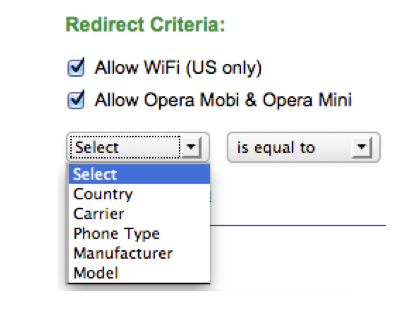 You’ll notice we also offer the option to set a unique redirection rule based on device model. Our proprietary database includes thousands of devices all pre-loaded for your convenience. You’ll find this very beneficial for you campaigns that respond differently to device size as you can target exact landing page dimensions. When you have selected the Available Models make sure you click Save Criteria to save the selection. You will then click close to return to the Campaign Level Redirects. Regardless of the split percentage the offer is hard selected therefore the traffic that meets the criteria of the rule will receive the traffic. Remember even though you have setup the split percentage in the above screen capture, it’s going to hard select the landing page and direct all traffic accordingly. 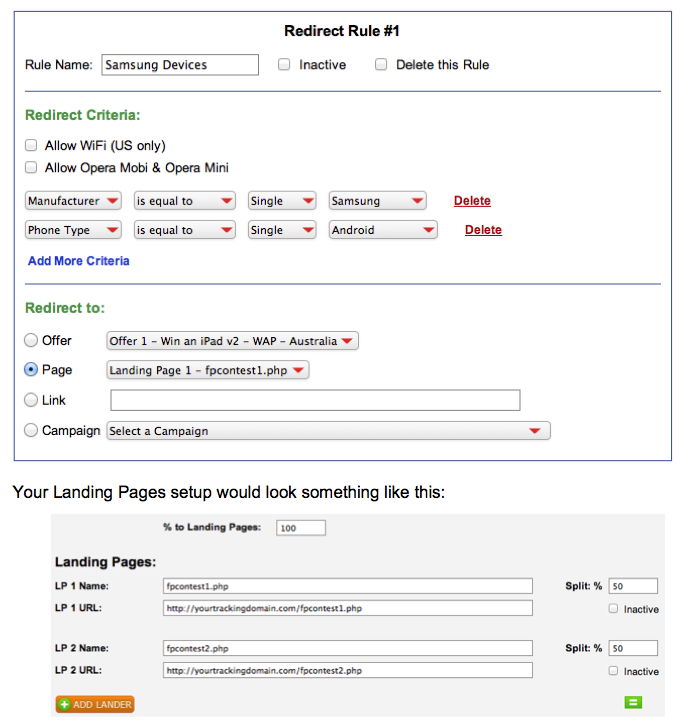 If you want to select a certain redirect criteria and have it directed to a campaign that contains multiple landing pages (to split test) then you would select that campaign from here. 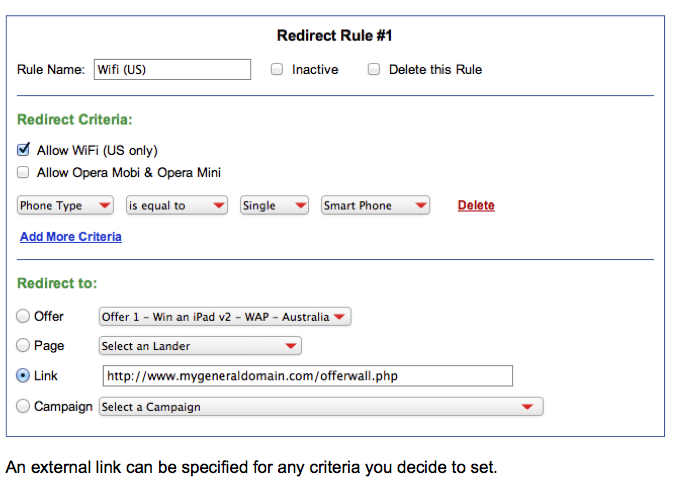 Please note the redirect criteria takes priority and will override any criteria in the selected campaign. 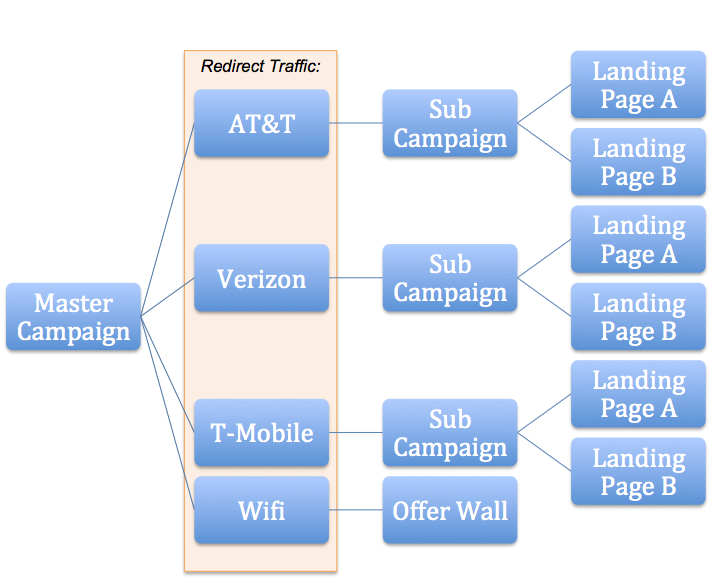 The Wifi run-off would then go to an offer wall that contains links to offers that can convert with this traffic. An example would be a couple of related applications. Prior to creating Redirect Rules you should physically map out exactly how the traffic should be routed and then setup accordingly. Keep in mind that the Master Campaign rules are going to overwrite any rules that you set inside the sub campaigns. We highly recommend running traffic before adding the rules as it will give you a good basis on how complex you need to design your rules to capture as much ROI as possible. This feature will allow you to purchase traffic at ad networks, exchanges, and on mobilized websites/applications that previously had weak targeting allowing you to leverage cheap clicks and high volume to your advantaged.